My love of a good LBD is well documented (in fact, at last count, I had 13 of them) so imagine my delight to discover that Brand Alley was releasing a whole new range of the lovely classics, from up and coming designers no less, but at affordable prices. Last month Brand Alley launched an exclusive design competition with Fashion Enter which saw a range of up and coming designers present their take on the iconic LBD. The 10 best designs have been selected by BrandAlley and a panel of industry experts and are being produced and sold exclusively via the BrandAlley website from September 15th. 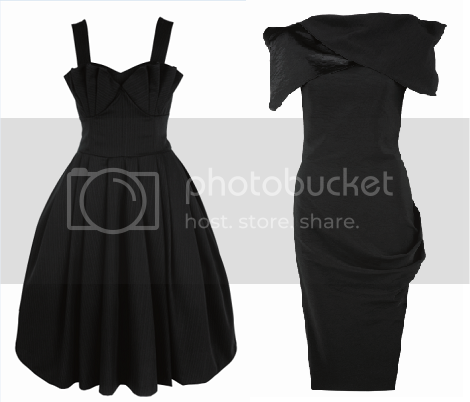 From left to right we have: the Batmobile dress by Alice Palmer, and the Audrey dress by Celia Fernandes. There was always going to be a classic "Audrey Hepburn-style" dress; she is the celebrity symbol of the little black dress! I love the sharp angles of the Batmobile (i've never knowlingly said no to a peplum! ), and of course, its name: my dad and I were delighted to discover recently that you can hire the Batmobile for weddings and other such events! Both dresses have a classic simplicity that means you can keep them in your wardrobe and wear them forever, but enough fashion forwardness to stop them from looking dull or ubiquitous. From left to right we have: the Charlotte by Evelyn Front and the Alia by Olga Papadopoulos.The Charlotte must have been designed with SATC's Charlotte in mind: this is my favourite dress from the whole range, I love its 50s styling, pleated details, and swingy skirt! The Alia has the kind of structure perfect for flattering curves, and although I wonder how you'd walk in the tight narrow skirt, the shoulder pleating makes it worth finding out! I love all these dresses: I can't be trusted with my purse when there are black dresses around! The exclusive ‘10 Little Black Dresses’ collection will be produced by Fashion Enter’s UK workshop and will be on offer at www.brandalley.co.uk in an exclusive two-week sale, from 15th - 30th September on a made–to-order service. Prices from £60 - £275 with limited edition dresses up to £650, delivery times will be a maximum of 3 weeks. Get in quick and snag yours before my willpower disolves and I take them all! Great Wedding Outfits in the UK. Mercedes Fashion Car-bootique - i'm a winner! LFW SS11 Leftovers from Day One! Slap on some lippie, and away we go! Events: Get your fashion on, and get involved! TU at Sainsburys: More supermarket chic? Latest H&M collaboration: Will it be Lanvin? Content copyright Tor Brierley, 2011. Powered by Blogger.